Kudu tables have a structured data model similar to tables in a traditional relational database. With Kudu, schema design is critical for achieving the best performance and operational stability. Every workload is unique, and there is no single schema design that is best for every table. This topic outlines effective schema design philosophies for Kudu, and how they differ from approaches used for traditional relational database schemas. There are three main concerns when creating Kudu tables: column design, primary key design, and partitioning. Data would be distributed such that reads and writes are spread evenly across tablet servers. This can be achieved by effective partitioning. Tablets would grow at an even, predictable rate, and load across tablets would remain steady over time. This can be achieved by effective partitioning. Scans would read the minimum amount of data necessary to fulfill a query. This is impacted mostly by primary key design, but partitioning also plays a role via partition pruning. The perfect schema depends on the characteristics of your data, what you need to do with it, and the topology of your cluster. Schema design is the single most important thing within your control to maximize the performance of your Kudu cluster. Kudu takes advantage of strongly-typed columns and a columnar on-disk storage format to provide efficient encoding and serialization. To make the most of these features, columns should be specified as the appropriate type, rather than simulating a 'schemaless' table using string or binary columns for data which could otherwise be structured. In addition to encoding, Kudu allows compression to be specified on a per-column basis. Attention: Unlike HBase, Kudu does not provide a version or timestamp column to track changes to a row. If version or timestamp information is needed, the schema should include an explicit version or timestamp column. Depending on the type of the column, Kudu columns can be created with the following encoding types. Data is stored in its natural format. For example, int32 values are stored as fixed-size 32-bit little-endian integers. A block of values is rearranged to store the most significant bit of every value, followed by the second most significant bit of every value, and so on. Finally, the result is LZ4 compressed. Bitshuffle encoding is a good choice for columns that have many repeated values, or values that change by small amounts when sorted by primary key. The bitshuffle project has a good overview of performance and use cases. Runs (consecutive repeated values) are compressed in a column by storing only the value and the count. Run length encoding is effective for columns with many consecutive repeated values when sorted by primary key. A dictionary of unique values is built, and each column value is encoded as its corresponding index in the dictionary. Dictionary encoding is effective for columns with low cardinality. If the column values of a given row set are unable to be compressed because the number of unique values is too high, Kudu will transparently fall back to plain encoding for that row set. This is evaluated during flush. Common prefixes are compressed in consecutive column values. Prefix encoding can be effective for values that share common prefixes, or the first column of the primary key, since rows are sorted by primary key within tablets. Each column in a Kudu table can be created with an encoding, based on the type of the column. Starting with Kudu 1.3, default encodings are specific to each column type. Kudu allows per-column compression using the LZ4, Snappy, or zlib compression codecs. By default, columns are stored uncompressed. Consider using compression if reducing storage space is more important than raw scan performance. Every data set will compress differently, but in general LZ4 is the most efficient codec, while zlib will compress to the smallest data sizes. Bitshuffle-encoded columns are automatically compressed using LZ4, so it is not recommended to apply additional compression on top of this encoding. Every Kudu table must declare a primary key comprised of one or more columns. Like an RDBMS primary key, the Kudu primary key enforces a uniqueness constraint. Attempting to insert a row with the same primary key values as an existing row will result in a duplicate key error. Primary key columns must be non-nullable, and may not be a boolean or floating- point type. Once set during table creation, the set of columns in the primary key may not be altered. Unlike an RDBMS, Kudu does not provide an auto-incrementing column feature, so the application must always provide the full primary key during insert. Row delete and update operations must also specify the full primary key of the row to be changed. Kudu does not natively support range deletes or updates. The primary key values of a column may not be updated after the row is inserted. However, the row may be deleted and re-inserted with the updated value. As with many traditional relational databases, Kudu’s primary key is in a clustered index. All rows within a tablet are sorted by its primary key. When scanning Kudu rows, use equality or range predicates on primary key columns to efficiently find the rows. Attention: Primary key indexing optimizations apply to scans on individual tablets. See the Partition Pruning section for details on how scans can use predicates to skip entire tablets. This section discuss a primary key design consideration for timeseries use cases where the primary key is a timestamp, or the first column of the primary key is a timestamp. Each time a row is inserted into a Kudu table, Kudu looks up the primary key in the primary key index storage to check whether that primary key is already present in the table. If the primary key exists in the table, a "duplicate key" error is returned. In the typical case where data is being inserted at the current time as it arrives from the data source, only a small range of primary keys are "hot". So, each of these "check for presence" operations is very fast. It hits the cached primary key storage in memory and doesn’t require going to disk. In the case when you load historical data, which is called "backfilling", from an offline data source, each row that is inserted is likely to hit a cold area of the primary key index which is not resident in memory and will cause one or more HDD disk seeks. For example, in a normal ingestion case where Kudu sustains a few million inserts per second, the "backfill" use case might sustain only a few thousand inserts per second. Make the primary keys more compressible. For example, with the first column of a primary key being a random ID of 32-bytes, caching one billion primary keys would require at least 32 GB of RAM to stay in cache. If caching backfill primary keys from several days ago, you need to have several times 32 GB of memory. By changing the primary key to be more compressible, you increase the likelihood that the primary keys can fit in cache and thus reducing the amount of random disk I/Os. Use SSDs for storage as random seeks are orders of magnitude faster than spinning disks. Change the primary key structure such that the backfill writes hit a continuous range of primary keys. In order to provide scalability, Kudu tables are partitioned into units called tablets, and distributed across many tablet servers. A row always belongs to a single tablet. The method of assigning rows to tablets is determined by the partitioning of the table, which is set during table creation. Choosing a partitioning strategy requires understanding the data model and the expected workload of a table. For write-heavy workloads, it is important to design the partitioning such that writes are spread across tablets in order to avoid overloading a single tablet. For workloads involving many short scans, where the overhead of contacting remote servers dominates, performance can be improved if all of the data for the scan is located on the same tablet. Understanding these fundamental trade-offs is central to designing an effective partition schema. Important: Kudu does not provide a default partitioning strategy when creating tables. It is recommended that new tables which are expected to have heavy read and write workloads have at least as many tablets as tablet servers. Kudu provides two types of partitioning: range partitioning and hash partitioning. Tables may also have multilevel partitioning, which combines range and hash partitioning, or multiple instances of hash partitioning. Range partitioning distributes rows using a totally-ordered range partition key. Each partition is assigned a contiguous segment of the range partition keyspace. The key must be comprised of a subset of the primary key columns. If the range partition columns match the primary key columns, then the range partition key of a row will equal its primary key. In range partitioned tables without hash partitioning, each range partition will correspond to exactly one tablet. The initial set of range partitions is specified during table creation as a set of partition bounds and split rows. For each bound, a range partition will be created in the table. Each split will divide a range partition in two. If no partition bounds are specified, then the table will default to a single partition covering the entire key space (unbounded below and above). Range partitions must always be non-overlapping, and split rows must fall within a range partition. Kudu allows range partitions to be dynamically added and removed from a table at runtime, without affecting the availability of other partitions. Removing a partition will delete the tablets belonging to the partition, as well as the data contained in them. Subsequent inserts into the dropped partition will fail. New partitions can be added, but they must not overlap with any existing range partitions. Kudu allows dropping and adding any number of range partitions in a single transactional alter table operation. Dynamically adding and dropping range partitions is particularly useful for time series use cases. As time goes on, range partitions can be added to cover upcoming time ranges. For example, a table storing an event log could add a month-wide partition just before the start of each month in order to hold the upcoming events. Old range partitions can be dropped in order to efficiently remove historical data, as necessary. Hash partitioning distributes rows by hash value into one of many buckets. 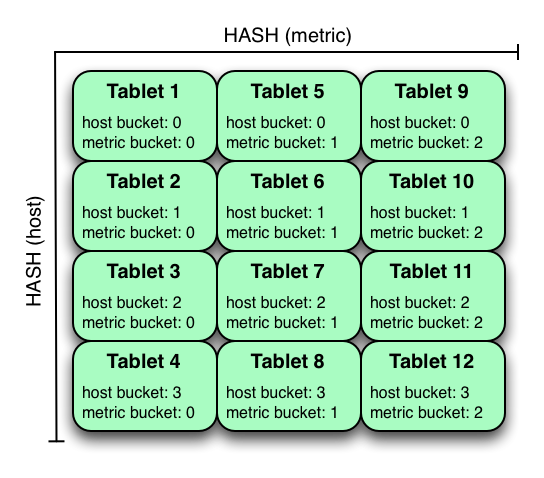 In single-level hash partitioned tables, each bucket will correspond to exactly one tablet. The number of buckets is set during table creation. Typically the primary key columns are used as the columns to hash, but as with range partitioning, any subset of the primary key columns can be used. Hash partitioning is an effective strategy when ordered access to the table is not needed. Hash partitioning is effective for spreading writes randomly among tablets, which helps mitigate hot-spotting and uneven tablet sizes. Kudu allows a table to combine multiple levels of partitioning on a single table. Zero or more hash partition levels can be combined with an optional range partition level. The only additional constraint on multilevel partitioning beyond the constraints of the individual partition types, is that multiple levels of hash partitions must not hash the same columns. When used correctly, multilevel partitioning can retain the benefits of the individual partitioning types, while reducing the downsides of each. The total number of tablets in a multilevel partitioned table is the product of the number of partitions in each level. Kudu scans will automatically skip scanning entire partitions when it can be determined that the partition can be entirely filtered by the scan predicates. To prune hash partitions, the scan must include equality predicates on every hashed column. To prune range partitions, the scan must include equality or range predicates on the range partitioned columns. Scans on multilevel partitioned tables can take advantage of partition pruning on any of the levels independently. A natural way to partition the metrics table is to range partition on the time column. Let’s assume that we want to have a partition per year, and the table will hold data for 2014, 2015, and 2016. There are at least two ways that the table could be partitioned: with unbounded range partitions, or with bounded range partitions. The image above shows the two ways the metrics table can be range partitioned on the time column. In the first example (in blue), the default range partition bounds are used, with splits at 2015-01-01 and 2016-01-01. This results in three tablets: the first containing values before 2015, the second containing values in the year 2015, and the third containing values after 2016. The second example (in green) uses a range partition bound of [(2014-01-01), (2017-01-01)], and splits at 2015-01-01 and 2016-01-01. The second example could have equivalently been expressed through range partition bounds of [(2014-01-01), (2015-01-01)], [(2015-01-01), (2016-01-01)], and [(2016-01-01), (2017-01-01)], with no splits. The first example has unbounded lower and upper range partitions, while the second example includes bounds. Each of the range partition examples above allows time-bounded scans to prune partitions falling outside of the scan’s time bound. This can greatly improve performance when there are many partitions. When writing, both examples suffer from potential hot-spotting issues. Because metrics tend to always be written at the current time, most writes will go into a single range partition. The second example is more flexible, because it allows range partitions for future years to be added to the table. In the first example, all writes for times after 2016-01-01 will fall into the last partition, so the partition may eventually become too large for a single tablet server to handle. Another way of partitioning the metrics table is to hash partition on the host and metric columns. In the example above, the metrics table is hash partitioned on the host and metric columns into four buckets. Unlike the range partitioning example earlier, this partitioning strategy will spread writes over all tablets in the table evenly, which helps overall write throughput. Scans over a specific host and metric can take advantage of partition pruning by specifying equality predicates, reducing the number of scanned tablets to one. One issue to be careful of with a pure hash partitioning strategy, is that tablets could grow indefinitely as more and more data is inserted into the table. Eventually tablets will become too big for an individual tablet server to hold. Hash partitioning is good at maximizing write throughput, while range partitioning avoids issues of unbounded tablet growth. Both strategies can take advantage of partition pruning to optimize scans in different scenarios. Using multilevel partitioning, it is possible to combine the two strategies in order to gain the benefits of both, while minimizing the drawbacks of each. In the example above, range partitioning on the time column is combined with hash partitioning on the host and metric columns. This strategy can be thought of as having two dimensions of partitioning: one for the hash level and one for the range level. Writes into this table at the current time will be parallelized up to the number of hash buckets, in this case 4. Reads can take advantage of time bound and specific host and metric predicates to prune partitions. New range partitions can be added, which results in creating 4 additional tablets (as if a new column were added to the diagram). Kudu can support any number of hash partitioning levels in the same table, as long as the levels have no hashed columns in common. In the example above, the table is hash partitioned on host into 4 buckets, and hash partitioned on metric into 3 buckets, resulting in 12 tablets. Although writes will tend to be spread among all tablets when using this strategy, it is slightly more prone to hot-spotting than when hash partitioning over multiple independent columns, since all values for an individual host or metric will always belong to a single tablet. Scans can take advantage of equality predicates on the host and metric columns separately to prune partitions. Multiple levels of hash partitioning can also be combined with range partitioning, which logically adds another dimension of partitioning. Multiple alteration steps can be combined in a single transactional operation. Kudu currently has some known limitations that may factor into schema design. For a complete list, see Apache Kudu Usage Limitations.